Spend eight days exploring Alaska's Inside Passage aboard your boat of choice: two luxurious and intimate yachts or a luxury small ship on this Discoverers' Glacier Country cruise. The 36-passenger Safari Explorer, the 22-passenger Safari Quest and the 84-guest Safari Endeavour feature luxurious accommodations and exquisite service as well as an itinerary filled with authentic exploration. 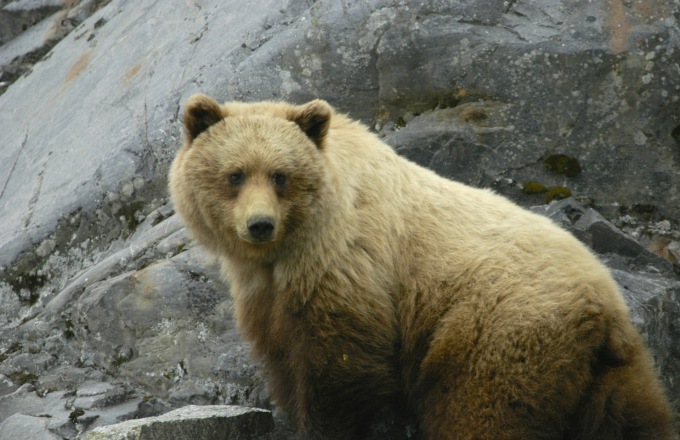 In Southeast Alaska, cruise through the largest national forest in the United States (Tongass) where grizzly bears, black bears, mountain goats, bald eagle and wolves make their home. View Alaska's massive glaciers and enter some of the worlds deepest fjords. In the still of the evening, watch bears ambling along wild shorelines. And everywhere in the swirling currents below, the worlds largest mammals, the great whales, forage in the bountiful waters along the sheltered shoreline. Meet Alaska and its wildlife at eye level. Kayak and small boat explorations offer a chance to explore the wilderness up close while an unhurried schedule means more time for watching whales, bears and other wildlife. On-board naturalists and expeditions leaders offer daily insights and guided nature walks. Your cruise begins and ends in Juneau, Alaska, and features the wonders and glaciers of Glacier Bay National Park, whale watching in Frederick Sound, bears near Icy Strait and Chichagof Island, and so much more. Experienced travelers appreciate the superior service, fine cuisine and intimate experience an Alaskan cruise aboard a luxury vessel offers. Welcome to Juneau. An airport transfer will bring you to meet fellow guests and your Expedition Leader at the Westmark Baranof Hotel. Depending on flight arrival time, there may be time to explore Juneau before boarding the yacht in the afternoon. The crew greets you with a glass of champagne as you set sail for a week of scenic channels and secluded wilderness. Glacier Bay National Park is Alaska on a grand scale - the park is larger than the state of Connecticut! Accompanied by a National Park ranger, over the two days in the park you’ll travel nearly 60 miles cruising up-bay to the tidewater glaciers of Grand Pacific and Margerie, which frequently calve huge icebergs into the bay. If conditions permit, the crew will lower the inflatable for you to weave among the icebergs that have fallen from the face of the glaciers. Enjoy evenings at anchor in hidden coves, and mornings paddling your kayak in the quiet of this majestic wilderness. Wildlife is everywhere - puffins and sea lions, mountain goats and bears, moose, eagles - and the scenery is more spectacular than any place on earth. During today's ultimate day of exploration, there's no agenda to follow except to experience every moment scouring the nutrient-rich waters in search for humpback, porpoise, sea lions and other wildlife. Join the Captain on the bridge or out on deck in search for marine mammals. Late afternoon have the opportunity to drop the skiffs and kayaks to further explore the shoreline of a remote bay. In the evening, continue to keep watch for the telltale blow of humpback whales as you cruise through Icy Strait. Before retiring for the evening take in the wilderness solitude while relaxing in the upper deck hot tub or enjoy a nightcap with your fellow yachtmates in the salon. With no binding agenda, today you’ll cruise along the waterfall coast of Chichagof Island. Marvel at the grand scenery of Alaska’s wilderness as the crew expertly guides you through those “not in the guide book” places known only to the locals. This evening, perhaps tucking away in magical Red Bluff Bay, there’ll be time for skiff operations and sea kayaking to look for sea otters and bears before calling it a day near Baranof Island. Spend the day cruising the feeding grounds of Frederick Sound and Stephens Passage — another excellent chance for viewing humpback whales and other marine wildlife. Pass by Five Fingers Lighthouse and watch for sea lions' playful antics at a large haulout made from dozens of islets. Later, cruise picturesque bays, where evergreen forests crowd the shores. Cliff-walled fjords sliced into the mountainous mainland are on tap today as you cruise into an area widely acclaimed as the most beautiful in all of Alaska. Snow gleams on mountaintops high overhead, as bears amble on the shoreline and mountain goats cling to impossibly precarious perches. Seemingly every few hundred yards another sparkling waterfall tumbles down the cliffs. Enjoy a skiff ride at Ford’s Terror, a pristine tidal inlet and fjord named after an early mariner who was somewhat taken aback when a waterfall appeared at the turn of the tide where none had been visible at high tide. The ice-filled fjord of Endicott Arm brings more impressive glacial calving. As you anchor overnight, enjoy the Captain’s Farewell Dinner in an utterly lovely setting and take in the Expedition Leaders' photo journal slideshow of your trip. The luxury motor yacht Safari Explorer embodies an ambiance of refinement and relaxation, with just 36 guests. Her crew of 16 takes care of passengers’ every need. The Safari Explorer cruises Alaska waters in the summer and the Hawaiian Islands in the winter. And a wellness program featuring hot tub, sauna*, yoga* and a complimentary massage* (*Safari Endeavour and Explorer only). The small ship M/V Wilderness Adventurer offers the ultimate in comfort and adventure when exploring Alaska's Inside Passage. Sailing with a maximum of 60 guests, the Wilderness Adventurer features 30 staterooms on three levels, providing an intimate and personal experience. The vessels small size and shallow beam allow it explore regions of Alaska's Inside Passage unreachable by most other vessels. Any cabin may be booked as a single for 175% of the double rate. Triple accommodations are available in the Commodore Suites and Admiral Stateroom aboard the Safari Explorer. Inquire for pricing details.